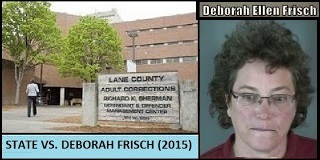 Eugene (Sept 28)--Oregon Criminal Deborah Ellen Frisch will be sentenced today for some of her voluminous criminal behavior so far this year. 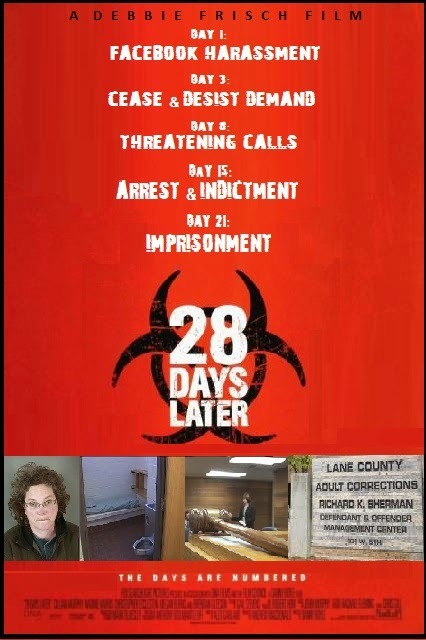 The hearing is scheduled for 8:30AM PST at Lane County Criminal Court. Miss Debbie pleaded guilty/no-contest to three charges last Thursday: 2 Class A misdemeanors and 1 Class B misdemeanor. In theory, the three charges could have yielded 2.5 years behind bars. According to the deal reached on Sept 24, Frisch is expected to be sentenced to a trio of 4-month jail-terms, to be served concurrently. Today's hearing would appear to close all outstanding criminal charges against Miss Debbie for her repeated criminal Stalking, Harassing, and Threatening behavior this year (both online and IRL). An inept federal civil complaint, frantically drafted by Debbie to avoid consequences of her criminal behavior, was filed Sept 21. County Jail for quite some time. and sentenced to a jail term ending on 27 May 2016. It is unknown whether Miss Debbie might be released earlier if jail overcrowding persists. Criminal Trespass and 3 counts of Telephonic Harassment.